If you’re like me, you’ve watched what can only be described as an obscene amount of soccer over the past week or so. Three matches a day, every day, can take a toll on you, especially when those matches are of the Croatia v Nigeria, France v Peru, or Sweden v South Korea variety. That’s not to say there haven’t been good matches – Portugal v Spain comes to mind – but the soccer world could use a bit of excitement, and while it is likely to come from the second round of group play, it could very well come from the offensively reinvigorated Vancouver Whitecaps. The Alphonso Davies and Friends show will go on the road as they visit Philadelphia this Saturday. Davies had maybe the finest performance I’ve seen from a Whitecap in his last outing, scoring one and assisting on three. By far the best player on the pitch and completely outclassing the hapless Floridian opposition. The match gave us some of the most excitement the ‘Caps have provided in a long time, and something else I haven’t felt much of lately – hope. For the first time this season, I saw a Whitecaps team that could make the playoffs and do something with their chance when they get there. It’s been two weeks since their last action, but they will need to ride that momentum from the exhilarating 5-2 victory if they are to prove themselves as legitimate contenders in this league. While they may be unbeaten in six, a string of draws and dropped points mean the Whitecaps need to start winning games and climb the ladder back into contention. If they play like they did against Orlando, that shouldn’t be a problem. To that end, I don’t think Robbo will want to make any changes to his team sheet for Saturday’s match. Brek Shea, to his credit, looked excellent partnering with Jake Nerwinski at fullback and provided a more dynamic attacking option from the left back spot than Marcel De Jong or Brett Levis. 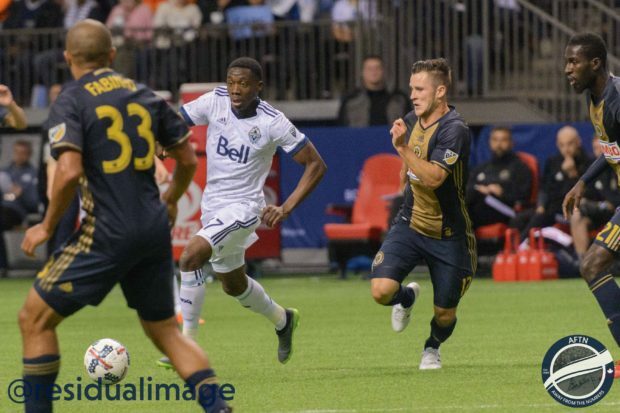 Doneil Henry looked excellent in his Whitecaps home debut, and could push his current partner Jose Aja out of a job upon the return of Kendall Waston, should his play continue at the same level. I was very very happy with the midfield, and the exclusion of Efrain Juarez. As it is a road match though, I fear Robbo may reinsert Juarez at the expense of Cristian Techera and return to the 4-3-3. But if no changes are made, and Aly Ghazal and Felipe centre a midfield with Techera and Davies out wide, I’ll be quite happy. I wouldn’t be opposed to starting Jordon Mutch, but I think it’s more likely we’ll see him off the bench. One thing that does seem set in stone is Kei Kamara at striker, with Yordy Reyna just off him. The Union won their final match before the break, a US Open Cup tie with New York Red Bulls, but have lost back-to-back matches in the league. They tend to set up an offensively-minded 4-2-3-1, with four players in attacking positions. Similarly to the 4-4-2 used by the Whitecaps in their last outing, the Union’s formation can transition to a 4-2-4 when on offense, overwhelming the defence and allowing for space and chances to be created. Fafa Picault and Ilsinho are wide midfielders that can bomb forward to support their striker, and central midfielder Borek Dockal has no reservations about getting involved offensively. Haris Medunjanin was slated to partner with the also attacking-minded Alejandro Bedoya in central midfield, but his suspension for an outburst at an official against Atlanta United has been extended two additional games, meaning Warren Creavalle will likely play instead. Jamaican international Cory Burke will likely be the lone man up top, and the usual defence of Keegan Rosenberry, Mark McKenzie, Auston Trusty, and Raymon Gaddis are expected to play in front of goalkeeper Andre Blake. I’m really hoping for an open, exciting match from these two teams. If all goes well, both managers will name an attacking line-up and set them up in a dynamic formation that allows them to seamlessly transition to a high-pressure offense. If Vancouver can mirror the intensity and pressure from their most recent match, they should be able to use the openness of play to their advantage and create chance after chance. And hopefully, it’ll be more exciting than a lot of these World Cup matches have been.